The growth and popularity of LED replacement bulbs has been quite remarkable over the past year. I can’t say that we are surprised, since LED bulbs offer so many benefits, including a cooler burning light, more energy efficient light (almost 90% savings as compared to incandescent bulbs), tremendous durability (about a 20 year life-expectancy), and much more. Years ago, the light color was inconsistent and the options were not there to switch all of your lights over to LEDs. If you had a room that had some candelabra base bulbs and some with larger medium base bulbs then you would have had trouble blending the LED lights together with what was already in use. Now the price has gone down and the quality and innovation has gone up. As a result, the market for LED replacement light bulbs is booming! We have customers using them inside chandeliers and ceiling fans, as well as floor and table lamps of all types. The upfront price of LED bulbs is noticeable when comparing them to incandescent choices, but when you factor in the 20-year life expectancy out of a single bulb, the price of LED bulbs actually becomes significantly cheaper than incandescent lamps that have a life span of 1-2 years. With the introduction of GE brand LED bulbs to our store, our selection has grown tremendously. We now stock candelabra base low wattage bulbs for the most delicate light in a chandelier. We also stock bathroom vanity globe lights, flame tipped bulbs, mini ceiling fan bulbs, push-in type flood lights, screw-in flood lights for recessed lights, and so much more. 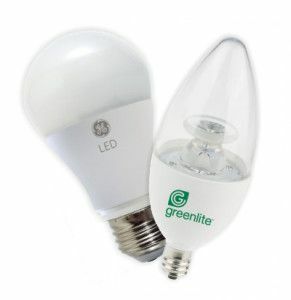 Stop by our Housewares Department to see our full selection of LED replacement bulbs from both GE and Greenlite!